Dr. Barber has participated in a wide range of exciting collaborative public history projects over the years. Working with teams of various sizes, she specializes in developing creative ways to engage audiences in stories of the past. For more projects, visit the Stories in Place website. The RTC 4th-Street Prater Way History Project is an innovative community partnership initiated by the Regional Transportation Commission of Washoe County (RTC) and culminating in a number of related public history projects intended to integrate the community’s history into future plans for the corridor and strengthen a sense of place. So far, these interlinking projects include the following. 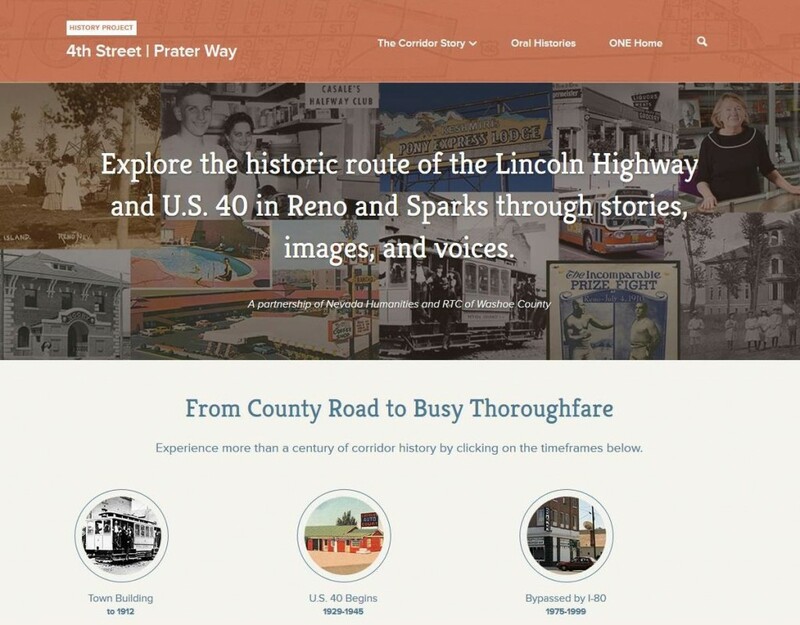 A multimedia online feature about the 4th Street-Prater Way corridor for the Nevada Humanities website, Online Nevada, featuring oral histories, a six-part historical narrative and slideshows of historical and contemporary images (4thprater.onlinenevada.org). Permanent historical displays inside RTC 4TH STREET STATION in downtown Reno (East 4th and Lake Streets) and RTC CENTENNIAL PLAZA in Sparks (Victorian Avenue at 15th Street). Entries about East 4th Street on the free website and smart phone app Reno Historical (RenoHistorical.org). Entries about Prater Way on the free smart phone app Sparks NV Historic Tours. Designs for eight new historically-themed bus shelters to be located along the corridor. 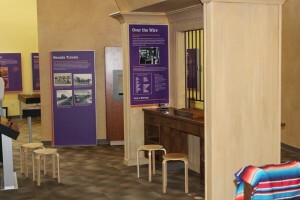 The historical display at RTC CENTENNIAL PLAZA consists of three panels with historical information, photographs, and a timeline, presented in both Spanish and English. 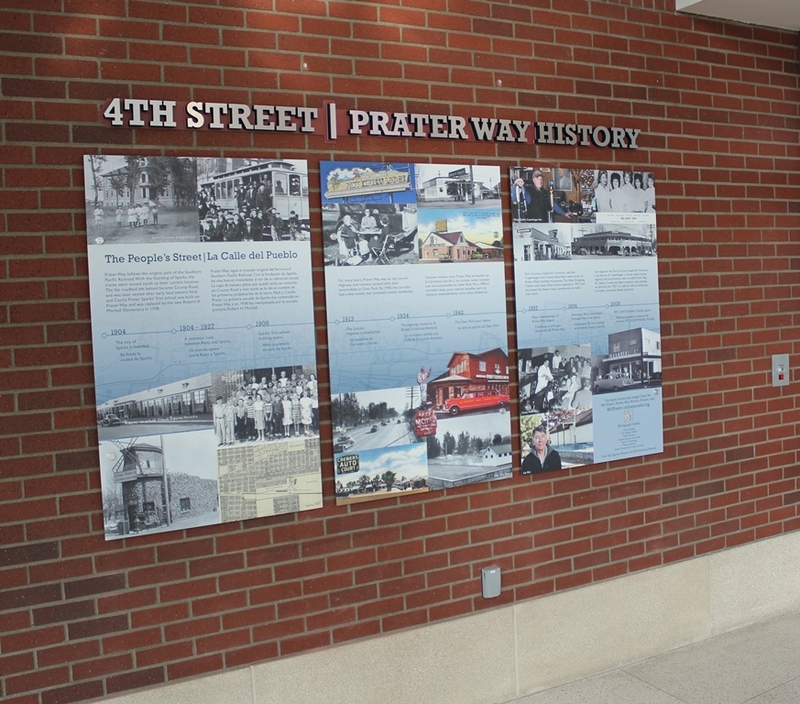 For more on the RTC 4th Street-Prater Way History Project and its community partners, click here. 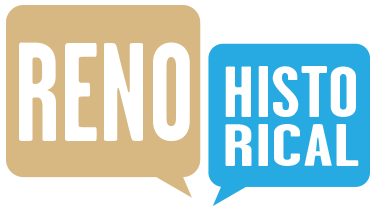 The Reno Historical smart phone app and website is a collaborative venture based in the Special Collections Department of the University of Nevada, Reno Libraries and benefiting from the participation of numerous organizations, archives, and individuals. Available as a free app for both Android and iPhone, the site contains the same information (and more) as the app and can be viewed at www.RenoHistorical.org. Reno Historical utilizes the Curatescape platform, developed by the fine folks at Cleveland State University’s Center for Public History & Digital Humanities. Reno Historical was co-founded by Donnelyn Curtis of the Special Collections Department and Dr. Barber, who continues to serve as the project’s editor. 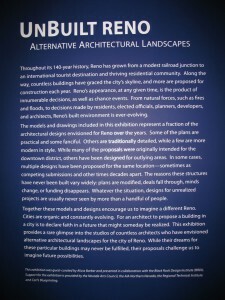 Read more about the project at http://www.aliciambarber.com/reno-historical/. As Director of the University of Nevada Oral History Program (UNOHP) from 2009-2013, Dr. Barber was faced with a number of challenges–perhaps most dauntingly, the elimination of all state financial support for the program, including formerly supported staff salaries and operating expenses. Founded in 1964, the UNOHP had produced well over 1000 recorded interviews, and yet transcripts were only available in print form in area libraries and upon request, and as separate files on CDs that had been distributed to state, county, and school district libraries several years earlier. 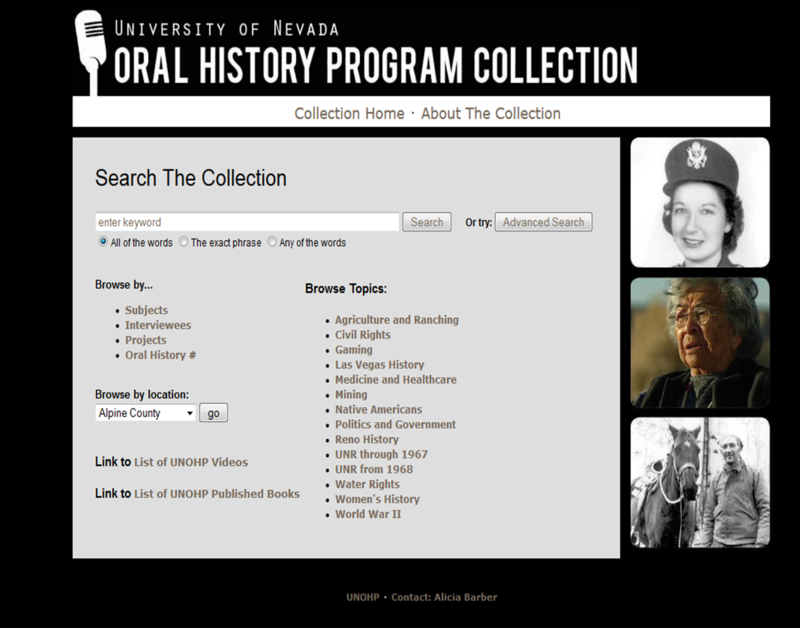 The online database can be found at www.unr.edu/oralhistory. Hoping to ensure that this extensive and remarkable collection would remain available to the general public, Dr. Barber embarked upon a four-year collaboration with the University of Nevada, Reno Libraries to create a fully searchable online database of all of the program’s published transcripts, professionally printed volumes, and highly acclaimed documentaries. The database launched in summer 2013 and can be found at www.unr.edu/oralhistory. The database was created in ContentDM, with streaming documentaries and full print of all published books. Search options enable viewers to search by keyword, person interviewed, Library of Congress subject heading, location, and more. Various topic categories further assist the casual viewer or dedicated researcher. Older volumes were reformatted into searchable PDFs for seamless searching and a consistent user experience. The project was funded through a combination of grants, gifts, and revenues secured from sales of bound oral histories and DVDs, and made possible through the tireless efforts of UNR Library staff and the dedicated graduate students working at the UNOHP. 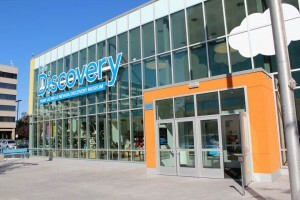 Dr. Barber’s work with the Nevada Discovery Museum focused on the creation of the Nevada Stories exhibit, an area dedicated to engaging children in stories about the state’s communities, industries, and environment. Serving on a committee alongside museum staff, exhibit designers, and community members, she participated for over a year in a series of discussions to determine what stories to present, and how best to create interactive spaces for children to experience them. The team’s primary motivation was to move beyond stereotypical depictions of a generic “West” to create an experience that was distinctly Nevadan. Nevada Stories attempts to make history personal and to establish continuity between the past and present. 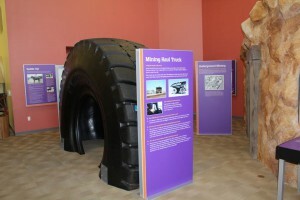 Individual activity areas connect 19th and 21st century practices, including the juxtaposition of a replica underground mine alongside a large tire from a modern haul truck, inviting children to consider differences in technology and techniques, their reasons and repercussions. 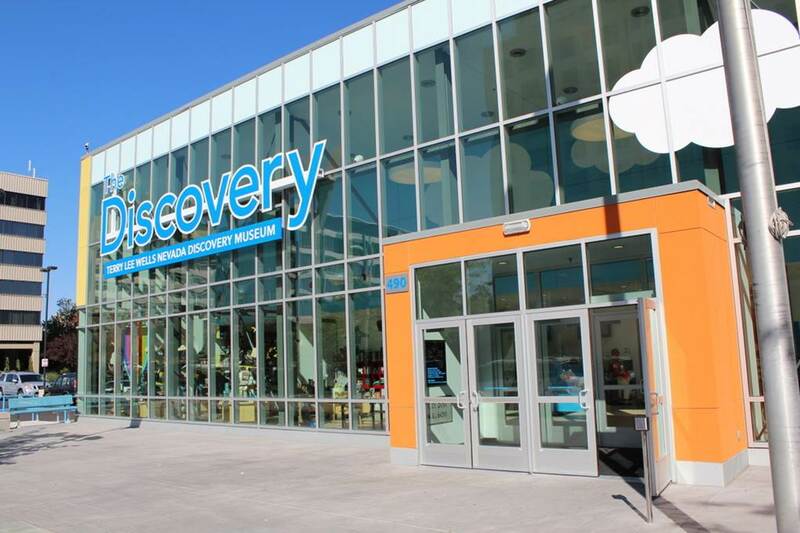 Interactive activities allow visitors of all ages to explore how the expanses of space between Nevada’s diverse communities have created challenges in transportation and communication. 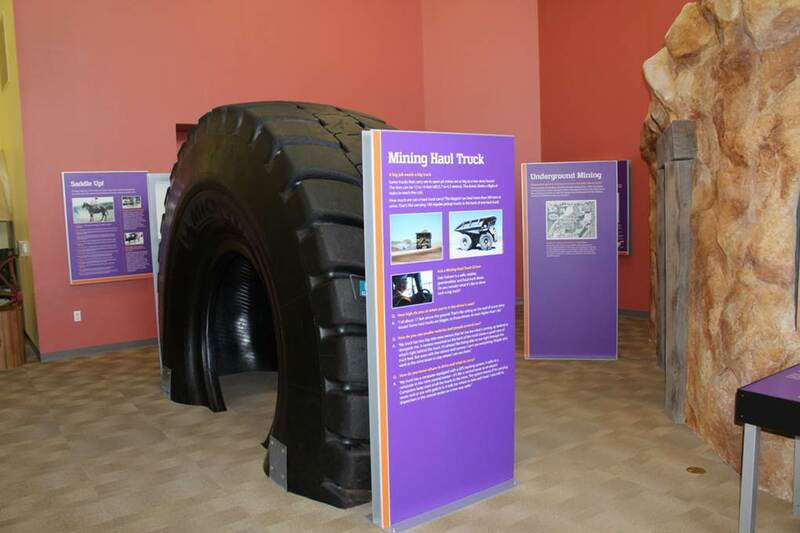 A depot in the exhibit’s center serves as a hub for discoveries about these related issues. A timeline highlights significant events in Nevada’s history and provides for numerous programmatic possibilities to complement the physical exhibits. The overall experience is dynamic, thought-provoking, and fun. As a guest curator for the Nevada Museum of Art (NMA), Dr. Barber collaborated with the Black Rock Design Institute to create an exhibition that explored unrealized Reno architectural designs. 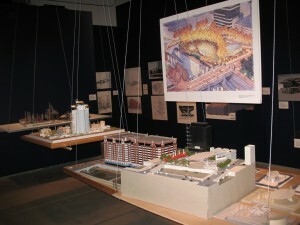 Titled UnBuilt Reno: Alternative Architectural Landscapes, the exhibition included architectural drawings, sketches, digital renderings, and scaled models of residential, commercial, and public projects from 1926 to 2008, including previous proposals for various riverfront development projects and innovative designs for area residences. 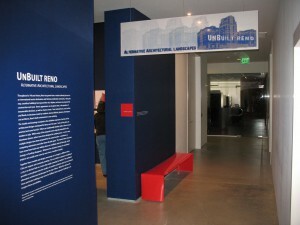 UnBuilt Reno was exhibited in the NMA’s Media Gallery from March 29 through July 6, 2008. Barber delivered an “Art Bite” presentation about the exhibit in the gallery on May 23rd. 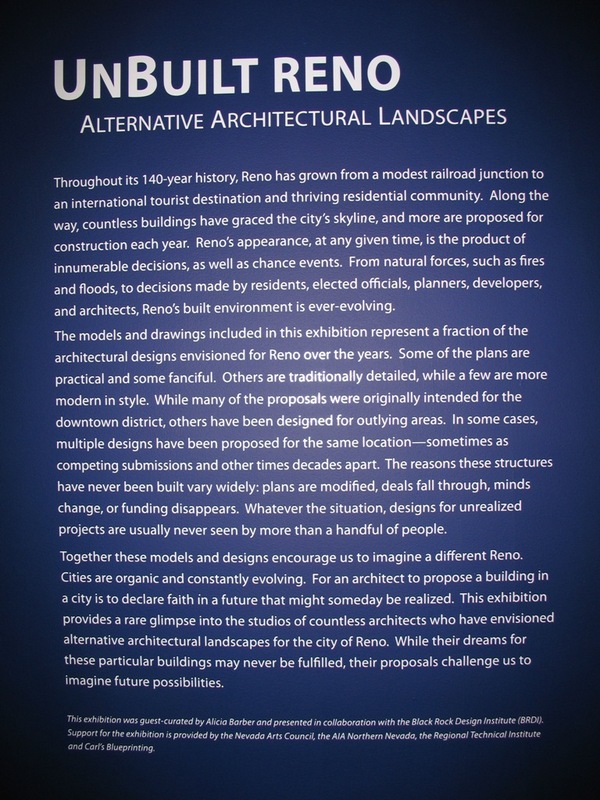 The exhibit was presented in collaboration with the Black Rock Design Institute (BRDI), a local non-profit organization founded to inspire an open and creative dialogue about the important design issues of our time, and to heighten awareness of design in the Reno community. Partial funding was provided by a grant from the Nevada Arts Council, a division of the Department of Cultural Affairs, and the National Endowment for the Arts, a federal agency. Additional support was provided by the American Institute of Architects (AIA) Northern Nevada chapter and the Regional Technical Institute. UnBuilt Reno featured 17 three-dimensional architectural models and 41drawings, sketches, and digital renderings. Featured projects ranged from Frederic DeLongchamps’ proposed 1946 addition to the historic Riverside Hotel to a soaring condominium design proposed by renowned architect Carlos Zapata for a riverfront site on the east side of downtown Reno. The brick-colored model in the center of this photo is a 1993 rehabilitation study by Cathexes of the historic 1947 Mapes Hotel, complete with an addition featuring retail space, restaurants, a time-share hotel, conference center, and parking garage. Hanging above is a proposed 2003 civic plaza design by Peter Walker and Partners for that same site after the Mapes Hotel was razed in 2000. This permanent installation at 10 N. Virginia Street in Reno was a collaboration with San Francisco artist Cork Marcheschi. 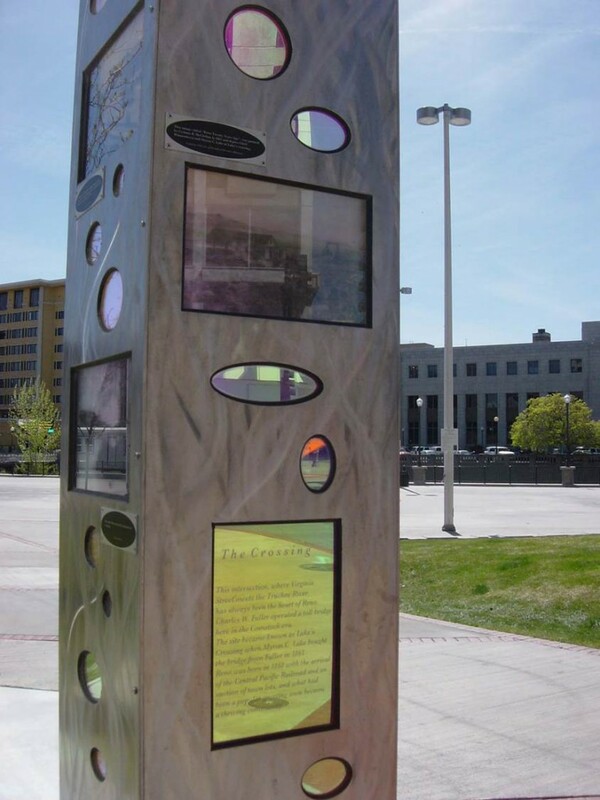 The series of six columnar sculptures, designed by Marcheschi, each features a geographical location or theme relating to Reno’s past. Working on behalf of the Historical Resources Commission, Barber conducted all the research, wrote all text, and collected the photographs that grace each piece. Standing on the former site of Reno’s venerable Mapes Hotel and Casino, which was imploded amid much controversy in 2000, the piece is intended to serve as a place of healing and historical memory for residents and visitors alike. It was dedicated in 2006. Looking southwest across the installation site, the historic Riverside Hotel can be seen on the opposite bank of the Truckee River. 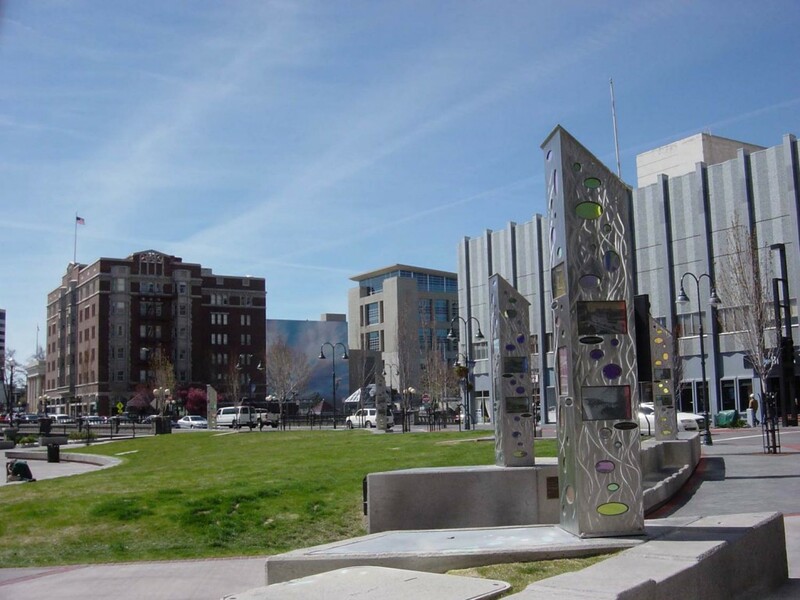 Located adjacent to Reno City Hall, 10 N. Virginia has since been renamed Reno City Plaza, and serves as a gathering place for Reno residents, the site of a seasonal ice skating rink, roller derby matches, concerts, and more. At the dedication ceremony. From left to right: Alicia Barber (Historical Resources Commission), Stacey Spain (Arts and Culture Commission), Michael Moreno (Arts and Culture Commission), Megan Merenda (intern). 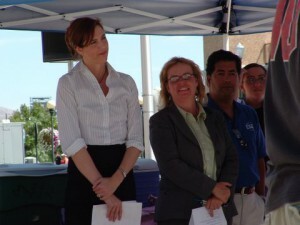 In July 2005, on the 100th anniversary of the completion of Reno’s historic Virginia Street Bridge, the City of Reno’s Historical Resources Commission (HRC), in collaboration with the Historic Reno Preservation Society, sponsored a birthday party for the bridge in the heart of downtown Reno. As a commissioner on the HRC, Dr. Barber chaired the committee and scheduled speakers featuring Nevada state archivist Guy Rocha, Nevada Historical Society curator of history Mella Harmon, and Judge Peter Breen, who officiated many Reno divorces over the course of his career. 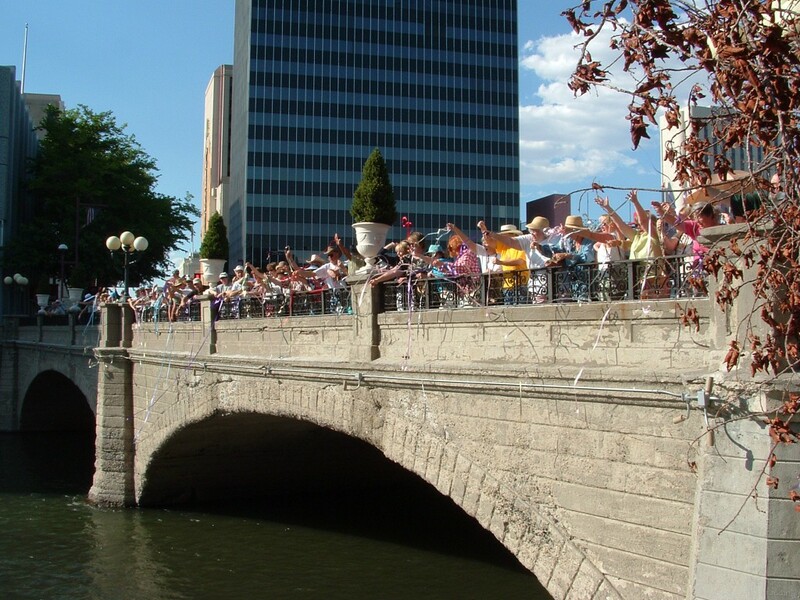 Following the speeches, a ceremonial “ring toss” was performed in honor of a longstanding Reno tale dating from the 1920s that new divorcees would stand on the Virginia Street Bridge and toss their now-defunct wedding rings into the waters of the Truckee River below, in a bittersweet gesture of freedom and new beginnings. All ring toss participants were given toy gold rings to “toss” over the bridge in one coordinated group fling. Brilliant colored ribbons tied to the rings created a lovely rainbow effect and kept the rings from actually dropping into the water. 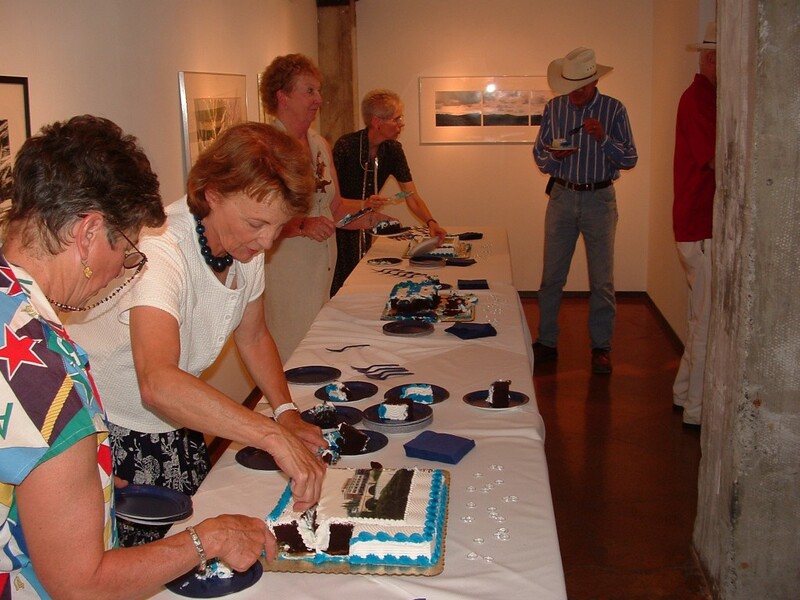 The reenactment was followed by a reception in the Sierra Arts Gallery, located in the adjacent historic Riverside Hotel, complete with birthday cake decorated with historic images of the bridge. For several years, Dr. Barber contributed to the locally produced public television series, House with a History, which still airs in repeats on KNPB. 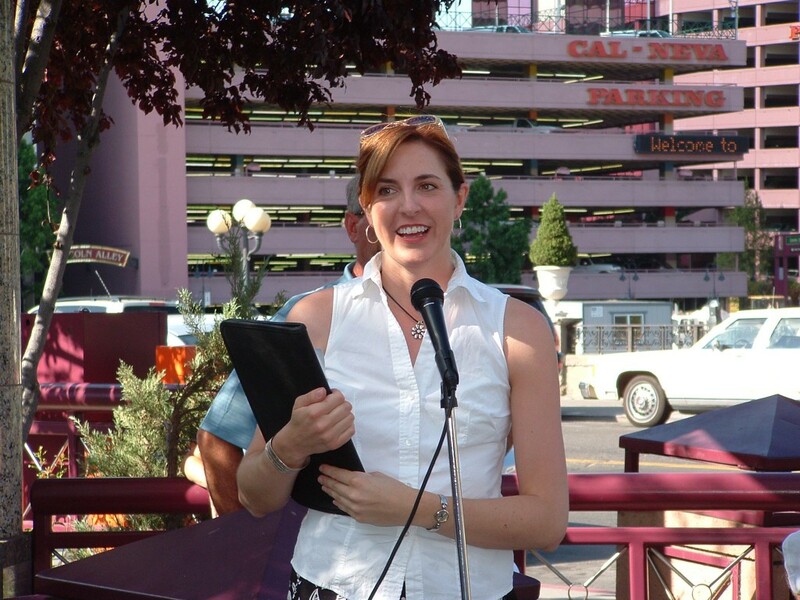 Serving first as an architectural historian/commentator and later as host, she was able to help bring the stories of some of Northern Nevada’s most fascinating historic structures to a broad audience. Join me for these events in September 2018! Copyright © 2019, Alicia Barber. All rights reserved.